This was the first of the tide-pool socks I was working on over the summer. 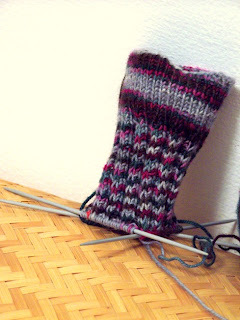 The yarn was Socks-That-Rock yarn, the pattern was Nancy Bush. 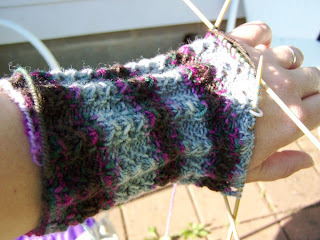 While I love both the yarn and the stitch pattern, the two together were not pleasing to me. So, tidepool went to the frog-pond. I am currently revisiting tidepool - using a slip-stitch rib pattern from Charlene Schurch's book. I am much happier with the results. The slip-stitch pattern breaks up the pooling and looks really nice to me. Of course the color did not turn out well in the picture above, so I will have to try and get a daylight picture.